1973 brought a return to the helmet style used in 1958 as Kush removed the three-inch Cardinal numbers, and replaced them with three-inch maroon numerals that more accurately matched the color of the helmet’s center stripe, using the “Alabama style” numerals with #1’s that had a top serif and bottom base. Another eleven win season, this one tarnished only by a November 3rd, five point loss to Utah in which the Sun Devils lost ten turnovers, gave Kush forty-three victories in four years and this offensive powerhouse totaled 6220 yards in their eleven regular season games. In seven of those games, the point tally read: 67, 67, 52, 44, 47, 54, and 55! QB Danny White and HB Woody Green both finished in the top ten of the Heisman Trophy voting and FB Benny Malone highlighted his senior season with a 250 yard rushing day against Oregon State. Green put up numbers that stood as ASU records for decades including 4188 rushing yards and forty-three TD’s and was a two-time Consensus All American, the Sun Devils’ first to win that honor and the first to rush for over 1000 yards in three consecutive seasons. Morris Owens hit his stride at wingback, catching fifty passes for 1076 yards. The offense overshadowed the defense led by LB's Bob Breunig who earned his second All WAC honor, and Larry Gordon and All WAC sophomore DB Mike Haynes. This was arguably the most explosive and best offensive team Kush had produced with White, Malone, Green, and Owens all contributing more than 1000 yards to the total offensive output. The pros quickly plucked All American White (who chose the WFL Memphis Southmen before starring with the Cowboys for thirteen years), Green (Chiefs first- pick), and Malone (seven years split between the Dolphins and Redskins). The year concluded with a 28-7 Fiesta Bowl win over an excellent Pitt team, highlighted by Green's three touchdowns but Kush knew that he would finally be facing a rebuilding year in 1974. 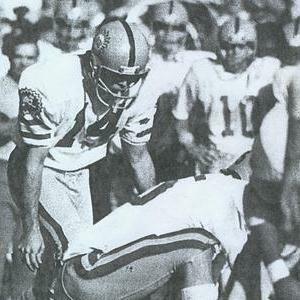 With seven NCAA records at the conclusion of his career, All America status, and the leader of the 1971 through '73 squads that compiled a 32-4 record, earned three conference crowns, and won three consecutive bowl games, Wilford Daniel White was by any measure, a great collegiate quarterback. Surprisingly, he was not heavily recruited out of Mesa, Arizona’s Westwood High School and with no football scholarships to offer this football legacy, Kush convinced baseball coach Bobby Winkles to give White a baseball scholarship. White paid huge dividends as a fearless team leader who often played with significant injuries, setting the tone for the rest of the squad. He led the country in pass efficiency in his All American year of 1973 and maintained a 41.7 yard average as a three-year punter. He threw for a startling 6717 yards and 64 TD's. Following in the footsteps of his father, Wilford "Whizzer" White who starred at ASU in the late 1940's, White's number, like his father's was retired following his Sun Devil career and he was the very first Sun Devil to be voted into The College Football Hall Of Fame. In 1998 Sports Illustrated Magazine named White the second-best all-time collegiate quarterback behind Steve Young of Brigham Young University. Entering the World Football League, White quarterbacked the Memphis Southmen before joining the Dallas Cowboys where he led the team to five playoff appearances between 1976 and 1988. He was also an All Pro punter with the Cowboys and returned to his native Arizona as the coach of the Arena Football Team, the Arizona Rattlers before taking on the task in 2006 of heading up the expansion Utah Blaze. Finally it seemed, Kush truly had to rebuild and had what appeared to be insurmountable losses on the offense. The 1974 defense was anchored by LB Bob Breunig who appeared on the cover of the media guide. Breunig finished at ASU as a three-time All WAC and All American star who would eventually land with the Cowboys, playing solid ball for them for ten seasons. Future Dolphin LB Larry Gordon, and All Conference DB Mike Haynes who led the nation with eleven interceptions were as effective but , '74 was for Arizona State, a terrible 7-5 season with a loss to lowly UTEP, and they were blanked 10-0 by hated Arizona. Sports Illustrated high school star Bruce Hardy came from Utah and won the QB job as a true freshman and ran well. Unfortunately, he was a scatter-armed passer and eventually wound up as an excellent receiver. A frosh receiver of note was John Washington a flashy speedster out of Dallas Roosevelt HS who would use his biological father's last name of Jefferson after his freshman season. "Fast Freddie" Williams provided 1299 rushing yards as a soph running behind two-time All WAC guard John Houser and Morris Owens wrapped up his career in fine style before going to the NFL as Miami's fifth round draft pick. Kush had learned how the other half lives and did not like it but no one could predict the outcome of '75 and just how great the turnaround would be. Excitement was high for the ’75 season as the team welcomed back former Tempe HS star QB Fred Mortensen from his two-year Mormon Church mission and a new helmet design. 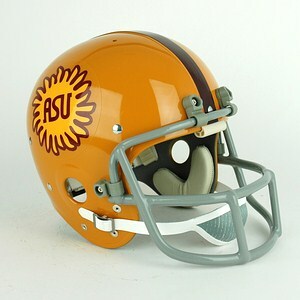 The sunflower helmet maintained the "standard" one-inch maroon center stripe but had a unique sunburst decal on each side of the helmet. The depiction of a sunflower gold blazing sun had a maroon outline and maroon ASU lettering within it that made for a distinctive logo. Kush placed three-inch “Alabama style” maroon numerals on the rear of the shells. Mortensen's return was exciting but he would share time with returning QB Dennis Sproul until he regained his sharpness. John Jefferson worked overtime, encouraging others to join him in off-season workouts and despite what was supposed to be a team less talented than previous Sun Devil contingents, the 1975 unit played on overdrive the entire year. "Fast Freddie" Williams paced the ground game with 1316 yards and nine touchdowns and finished his ASU career second on the all-time rushing list to Woody Green with 3424 yards and two-time All Conference honors. He played briefly with Saskatchewan in the CFL. Jefferson came into his own with an 18.4 yards per catch average. Bruce Hardy settled in as a fine TE and kicker Danny Kush proved to be an effective scoring weapon. The defense did not give up a rushing touchdown until the ninth game of the season, a 21-20 victory against Wyoming's Wishbone offense and earned the nickname "The Crunch Bunch", led by All Americans LB Larry Gordon who had a very productive career with the Dolphins and Mike Haynes, who would go on to a Pro Football Hall Of Fame career with the Patriots and Raiders at DB. Haynes finished at ASU with seventeen pass interceptions and because he could cover any opponent’s best receiver one-on-one, he was nicknamed “Luxury” by Coach Kush because his ability provided the rest of the defense the luxury to double-team other receivers. The defensive front was paced by a pair of All WAC down linemen, DT Randy Moore who played with Denver the following season and DE Willie Scroggins. They took their top ten ranking into the Fiesta Bowl as underdogs against 10-1 Nebraska with the blessing of USC Head Coach John McKay who stated, "I want Arizona State and Arizona in the PAC-8." Arizona, enjoying a fine 9-1 season going into the season finale against the Devils, were upended on what is still referred to as "The Catch", a diving, seemingly impossible ball to get to that was caught as the half ended by JJ Jefferson. "The Catch", immortalized in photos and posters all over the state the following year, turned what appeared to be a cinch Arizona victory into the 24-21 win ASU needed to secure the Fiesta Bowl berth and they took advantage of it. With Danny Kush supplying three field goals, Arizona State upset the mighty Cornhuskers 17-14 and were named the number two team in the country behind Oklahoma with Kush voted as the National College Coach Of The Year. If there was a high water mark in the successful reign of Frank Kush, this was it. A three-time all WAC and two-time All American performer who finished his distinguished college career with seventeen interceptions, DB Mike Haynes was also a feared punt returner, a skill he took with him to the NFL as the Patriots number-one pick in the1976 draft. The Los Angeles product, a four year starter, was not only a blanketing cover man but a crushing tackler whom receivers learned to avoid. Haynes led the nation in interceptions in 1974 and was named All American in '75. As a fields event performer for the Sun Devil track squad, he set the school record for the long jump. He had a Pro Football Hall Of Fame career with the Pats and Raiders, beginning his NFL campaign as Rookie Of The Year, All AFC, second team All NFL, with eight interceptions and punt returns totaling 608 yards and two TD's. His NFL career total of forty-six interceptions alone would have given him Hall Of Fame credentials but his on-the-field leadership and presence was invaluable to the Patriots and after the settlement of a contract dispute, with the Raiders. A five-time All Pro, he appeared in nine Pro Bowls and Mike Haynes for many, remains the standard against which all defensive backs are measured. Haynes remains the only Sun Devil gridder to be inducted into both The College Football and Pro Football Halls Of Fame.